Thunder on the Battlefield Virtual Tour! 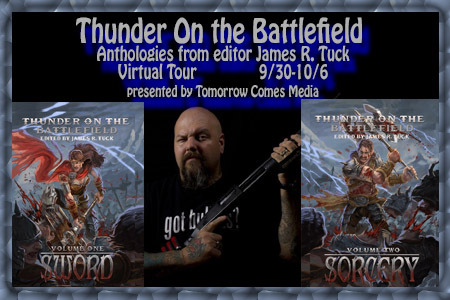 Beginning on the 30th September is a Virtual Tour (presented by Tomorrow Comes Media) to help promote and spread the word about both volumes of Thunder on the Battlefield. I’ve had the honour of writing a guest post which will be up at Beauty in Ruins on the 3rd of October, in which I’ll be talking a bit about (among other things) the inspiration for “Mark of the Warrior”. Be sure to check it out, as well as the many other guest posts, interviews and reviews. This entry was posted on Thursday, September 26th, 2013 at 11:14 pm	and tagged with Anthology, Fantasy, guest post, Mark of the Warrior, Seventh Star Press, Sword & Sorcery, Thunder on the Battlefield and posted in Thunder on the Battlefield. You can follow any responses to this entry through the RSS 2.0 feed. « Latest Review for “Warrior”/Thunder!